We are very excited to announce our second litter of 2016: born January 9th! Champion Poolside Rascal Cats of KotyKatz strikes again with another litter of gorgeous rosetted babies! 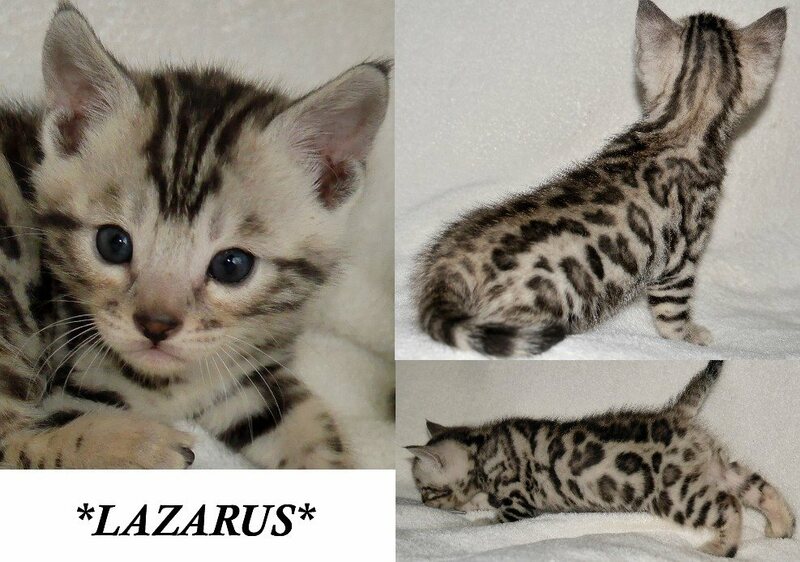 Mom, Bengalscape Estonia of KotyKatz, has thrown in the right mix of genetics to produce these outstanding little Bengal kittens. Of the silver rosetted kittens we have this little male, Lazarus. This would be the final single released by David Bowie, released on 17 December 2015. It was his first top 40 hit single on the Billboard Hot 100 in more than 28 years, and would eventually land at number 40. According to Bowie’s producer Tony Visconti, both the lyrics and video were intended to be a final gift to his many adoring fans. This entry was posted in Bengal Kitten Gallery, Gallery and tagged bengal kittens, David Bowie, Lazarus, silver rosetted. Bookmark the permalink.